300168A - RAMP PLATE FOR 500 OR 780 SERIES DRIVE UNIT | Comet Industries 300168A. 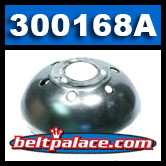 Home > Comet Clutches and Parts > Comet 302284C: C-500 Drive Clutch > Comet 300168A: RAMP PLATE 500 or 780 DRIVER. Comet 300168A: RAMP PLATE 500/780 DRIVER. Comet 300168A. RAMP PLATE FOR 500/780 SERIES DRIVE UNIT. Replaces worn out or dented Comet Industries 500 or 780 Series Clutch "Cover" (Ramp Plate). NOTE: We recommend checking roller weights for "flat" spots and replace them as needed when replacing this part.